My Dearest Daughter - the meet my grandpa edition! In 1958 my mother got married and moved across the country. These are the letters written to her, mainly by her mother, between 1958 and 1960. Others in the series are in my del.icio.us file. This week's letter is written by my mother's father, my grandpa. His name was Calvin and my oldest boy is named for him. Grandpa Calvin was the second of ten children. He was a farmer, a welder, and sold World Book encyclopedias, but he could fix or build pretty much anything he put his mind to. 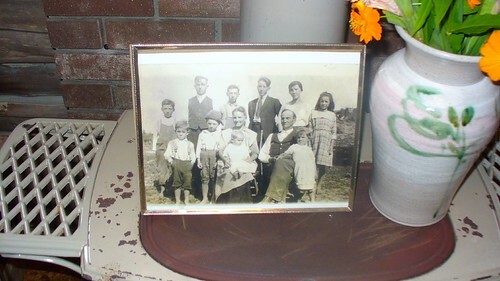 In this picture he is the second from the left in the back row. In this letter he talks a lot about his mom and siblings (Sam, Ernest, Elmer, Ivan) and a lot about family friends. Elmer worked for World Book Encyclopedias and that comes up in this letter as well. Does that sound far off? The Lovers? This is Pop. How are you? No, it never showed up so I couldn't shoot a deer! I dressed one out for Paul Hammond - 16 points! Grandma (He's talking about my great-grandma - his mother) is fine. I was with her a week and did I see (a lot of ) old pictures and eat a lot of food too! I went up to see Ernest and Sam (his brothers) for Friday and Saturday. Ernest was to go to sea the night the ship Bradley went down. It broke in two and took 33 men with her. There was a funeral mass at Rogers City for the dead. The boat Ernest was to go on was docked until the storm broke. Was your Aunt Fern happy. I was hunting with Bob (Sam's boy) Saturday morning about nine thirty. I sprained my left ankle so I've been sitting here ever since. Calvin and I each shot four birds and two rabbits. We can have goose while you are here at home. Two of our young heifers freshened and are they dandy! One had a black angus heifer calf. Is she cute! That may be the start of beef cattle. We are shipping nearly six cans of milk a day now. We are ready to mail the last payment on the farm and we can burn the mortgage when you kids are home. We had turkey for Thanksgiving dinner. I took pumpkin pie out to Harry and Erma (best friends). She is pretty well now again. Harry is interested in a tractor now. He told me he could hardly put harnesses on the horses any more. He has fixed up the house and yard very nice. Calvin wrote and told you we had sixteen loads of corn. Our picker worked very good. I sold the old husker for $100. Calvin said every Saturday we could hunt rabbits but we had to husk corn. I know this letter is misspelled, hit and missed cause that is the way I think. I am going to help fix a house for a woman and nine children. Her husband left her. St. Vincent DePaul group will do the work. If you have much trouble with the station wagon put in a set of new spark plugs and points. I'll try and get some for you. We winterized the tractors today. They all need work badly. Did you know your Uncle (Elmer) lives near South Bend Indiana? They promoted a young man past him and was still good old Elmer. So he raised his voice. Ivan took him in. I think he needs more training to be a manager. Boy that made me sore and I haven't sold a book since. I'm going to try tomorrow again. It is snowing today. They say we are due for four inches. Well I didn't do so bad did I!